Any bride, former bridesmaid, or mother of a former bride or bride to be knows the terrible truth: getting through a wedding from start to finish just might cost you what little sanity you have in your life, and planning a wedding in Cancun or destination wedding to anywhere else in Mexico can add additional layers of stress to the process. I ought to know…not about the destination part, but about the wedding part, in general. Stick around a minute…I’ll tell you all about it, and give you the best ways out of some of the most common problems our Cancun wedding photographers have seen over the years. 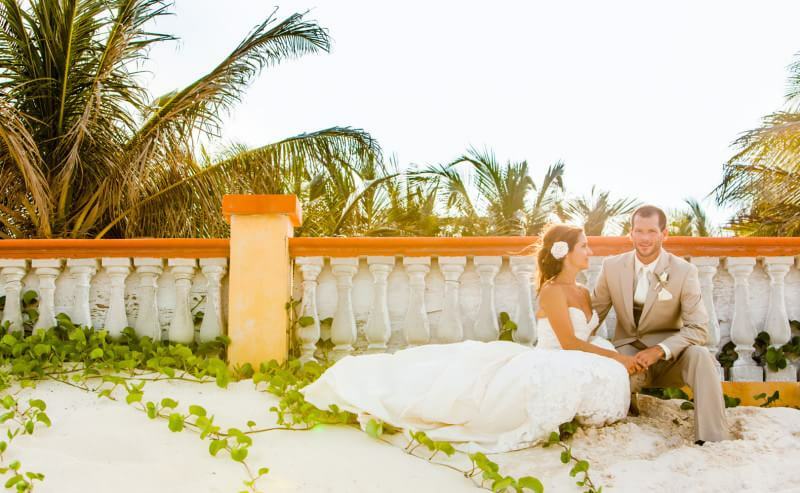 You don’t need a Cancun wedding photographer, to tell you that having a destination wedding requires planning ahead. And while you might be nervous about having your wedding a couple thousand miles away, you can use the situation to your advantage. Some brides, grooms, friends, and family tend to hold up the wedding plans, causing disaster. But when you have a destination wedding, there’s no opportunity to do that. You’ve got to have your plans laid out months in advance, from booking the resort to booking your wedding photographer to getting a dress, booking plane tickets, and more. Because you have to plan ahead for your destination wedding to get the best deals and the vendors you want, you’ll find that few family members and friends will put roadblocks in your way. My own wedding was close to home…and for some reason it feels like people believe that if you get married in the city where you live, then changing your plans for them shouldn’t be a problem. My sister scheduled my nephew’s baptism for my exact wedding date and, I kid you not, said, “This is the most important day of his life…why do you have to be so selfish? Why can’t you just change your wedding date? !” Ummmm… Dang near lost my mind and my ability to keep from committing a murder that day! Planning ahead also means learning everything you can about how having your wedding in Mexico is different than having your wedding somewhere else. You can learn all about it on our blog and read our Mexico wedding FAQ to get more information. Don’t forget to book your hair and makeup in advance, and to try out your styles at home before you get to your Mexico destination. I am a perfectionist. I want everything to be perfect to my standard of perfection and I know that you do, too. Do you realize how much work it takes to plan a wedding? Even a small one? There are Save-the-Date cards, invitations, giveaways, hotel rooms, bouquets, Groom’s and groomsmen attire, Mexico wedding photographers, videographers, booking ceremony and reception locations, buying champagne, getting catering, and more. You don’t have to do it all. Once you’ve picked out photographers you like, find a friend that knows a lot about photography to help you narrow down your choices for an excellent Cancun wedding photographer, and don’t forget to give them our tips on how to choose a wedding photographer and why it’s important to hire a professional wedding photographer. While you can’t totally delegate the task of hiring a photographer (and shouldn’t! It’s one of the most important parts of your wedding day) other tasks you CAN delegate include: stuffing and sending invitations and save-the-date cards, working with the wedding planner on the day of your wedding, helping choose attire for the mother and father of the bride and groom, dealing with “difficult” people, interfacing with the florist, and more. You should also delegate the tasks of getting gear for your day—your guestbook, gifts, shoes, emergency sewing kits, sunscreen, and more—to someone trustworthy. Getting the things you need for your day once you get to Mexico can be next to impossible, especially if you don’t know where the nearest convenience mart is located. Here’s the most important thing to remember: your wedding is supposed to be the happiest (and most-stress-free day of your life). And now here’s the news you really need to pay attention to: it will not be perfect. You can visit the destination in advance, meet your Mexico wedding photographer and other vendors ahead of time, sign all of your contracts, have everything lined up in labeled boxes and neat little packages, and something may still happen that rocks your boat…or in my case, capsizes it. On my wedding day, we had rented a beautiful park for our wedding. The management forgot to block the public from coming in and…it gets better…forgot to tell the maintenance crew not to mow the lawn that morning. Not only was the grass dewey and the clippings turned everyone’s feet, pants, and the bottom of my wedding dress green, but they were still cutting the grass through the entire ceremony, despite being asked to stop multiple times. Children ran through my wedding. A dog jumped into the lap of one of my guests. Not to mention, the vines in the park didn’t bloom on time, so it looked like I was having my wedding in a cemetery scene from a movie, and my Aunt Peggy kept literally pushing the photographer out of the way. And one of my bridesmaids was sunburnt to a crisp! On my wedding day, I thought I might die. But I didn’t. And you won’t either. There will be the errant individuals who make their way into your private ceremony. There will be annoying seagulls and other birds, breezes, a boiling sun, possible rain, and other unexpected moments on your wedding day. Don’t let anything rattle your bones or shake your confidence. The dog, kids, grass clippings (even in my hair…what’s up with that?! ), grass stains, sunburns, scraped knees, scraped cheeks, sunburns, overbearing family members, breezes, non-blooming vines, and everything else that went wrong at my wedding are some of the memories I remember most. And I laugh now…because I have realized that I let all of that get to me for no reason. And you will, too. Keep it together, push off responsibilities on other people, and let everyone else take care of you and your needs, so you can focus on what’s really important: marrying the love of your life.